The theme of the twenty-eighth issue of InVisible Culture makes explicit something that has resonated throughout the past four issues of our journal. From engagements with vulnerability and states of contagion (Issue 24: Corpus), and the intersections between surveillance, (national) security and the visual (Issue 25: Security and Visibility), to an issue inspired by the refugee crisis (Issue 26: Border Crossings) and another devoted to the proliferation of speculative imaginaries in the present moment (Issue 27: Speculative Visions), these issues suggest that “across diverse and geopolitical locations, the present moment imposes itself on consciousness as a moment in extended crisis.”1 Defined by the global uncertainty of a world afflicted by varied and ambiguously interrelated states of emergency, the concept of “crisis” here refers to a multitude of circumstances, events, and situations: military conflict, debt crises, issues of political representation, the mass migration and displacement of refugees, increasing ecological disruptions. These ruptures in the social demand constant attention from individuals and communities, constituting a need for committed artistic and scholarly engagements with questions of what it means to be in crisis and how to deal with it. Following these trajectories the issue committee arrived at the question: how does one contend with crisis? By proposing ‘crisis’ as a dedicated site of inquiry, we prompted authors and artists to contemplate its liminality, exploring both its emancipatory and repressive affordances across a variety of conceptual and material contexts. The multiplicity of approaches to crisis collected in this issue only reinforces the critical potential of the term. Emma Lansdowne’s article “Crisis of Invasion: Militaristic Language and the Legitimization of Identity and Place” examines the wide-ranging use of invasion terminology to describe the cross-border movements of human and non-human agents in relation to the politics of belonging in today’s globalized climate. In a world fraught with social, economic, political and military conflict, the language of threatened security is a response to what many perceive to be a fading of borders, imagined or otherwise. Yet a wholesale problematization of notions of “invasiveness” risks undermining legitimate indigenous claims to sovereignty and calls for decolonization. The Amsterdam-based refugee collective “We Are Here” was formed in 2012 with the project of making visible the conditions of crisis that out-of-procedure refugees in the Netherlands are forced to endure. They continue to work towards achieving “a structural solution for anyone who is in our situation and for all others who might find themselves trapped in the same political and legal vacuum.” While attaining such recognition is undoubtedly indispensable to overcoming the crisis in which they live, Christian Sancto’s “Visibility in Crisis: Configuring Transparency and Opacity in We Are Here’s Political Activism” argues that “We Are Here”’s activist practice has politically consequential effects beyond any ostensible aim of constituting its members’ legal intelligibility. His argument is based on a comparative reading of Judith Butler’s theoretical account of collective rights claims and Édouard Glissant’s simultaneously ontological and political conceptualizations of transparency and opacity. He focused in particular on the resonances of Glissant’s syntagma “the right to opacity” with Butler’s work on the performative dimension of “extralegal” rights claims. He argues that, as exercises of the right to opacity, “We Are Here”’s activities index a politically transformative possibility emerging from the crisis of legal (in)visibility that envelopes its members’ lives. In the article “Four Times Egyptian Identity: Mural collaboration as dissent in times of crisis,” alma aamiry-khasawnih follows changes of the Egyptian Identity mural on Qasr El-Nil Street in downtown Cairo from its creation in June 2013 until its erasure in November 2015. She argues that the life of this mural allows us to trace the ways graffiti and mural artist-activists of the 2011 Egyptian revolution negotiate and resist increased policing and surveillance of the streets. By examining the ways these artist-activists collaborate and coordinate their engagements with this mural, Khasawnih-Aamiry traces how they understand this period of transition and open up spaces for alternative imaginaries to be explored. Puerto Rico, a US Territory with a population of 3.474 million people, that is neither a sovereign nation nor state of the union, is in the midst of an ongoing financial crisis with an accrued debt of over $73 billion and $49 billion in pension obligations, the largest economic insolvency in the history of the United States. Caroline Gil’s article “La Bola de Cristal: Puerto Rican Meme Production In Times Of Austerity and Crisis” explores how in this context meme production has emerged as a trend that unveils the frustrations of the citizenry after decades of corruption, the recent imposition of a Fiscal Control Board, and synthesizes a moment in time apropos to the island’s history as a colony of the U.S. In 2002 during the Second Intifada, the Israeli Defence Forces launched “Operation Defensive Shield,” the largest military operation in the West Bank since the 1967 Six-Day War. Invading Ramallah, followed by Tulkarm, Galqilya, Bethlehem, Jenin and Nablus, the IDF infringed upon a territory of people that it continues to occupy today. Sherena Razek’s article, “Black and White and Back: Reversed Negatives in Rula Halawani’s series Negative Incursions,” analyzes the response of Palestinian photographer Rula Halawani who documented the Israeli offensive with a photographic body of work entitled Negative Incursions (2002). The series includes large format negative prints that interrupt disassociations of violence through a process of negation that metaphorically and methodically challenge the fatigued consumption of images of suffering. Highlighting and rendering visible what is normally concealed in shadow, and subsequently masking the things that are usually most evident, Halawani’s series creates an inversion of the conventional documentary photograph. This aesthetic transformation engages with what John Roberts deems a necessary violation of photography in an effort to antagonize the critique of its complicity as a medium in his book Photography and its Violations (2014). Approaching the photographs in this series as manifestations that challenge the history and nature of the negative photograph and the history of documentary modes, I will address the following questions: Does the aesthetic choice to invert documentary images into negatives have the potential to produce affect or does it simply increase the status of atrocity as a spectacle, as so many media images do? And more emphatically, what can this process of negation, the inversion of colour, life, body, and image, accomplish when representing a current case of colonial occupation in Palestine that has so often been understood in black and white? “Your father was born 100 years old, and so was the Nakba ابوكي خلق عمره ١٠٠ سنة، زي النكبة“, is a short experimental documentary that explores the Palestinian displacement through subjectivity. Razan AlSalah uses glitch poetics and Google’s streetview aesthetics of erasure to tell a personal story that relates to universal disposition of loss, injustice and distance. Anna Haglin’s work addresses social justice through expanded forms of printmaking. Using print’s history of democratic distribution, she examines the ways we communicate about difficult subjects such as climate change and humanitarian crises. 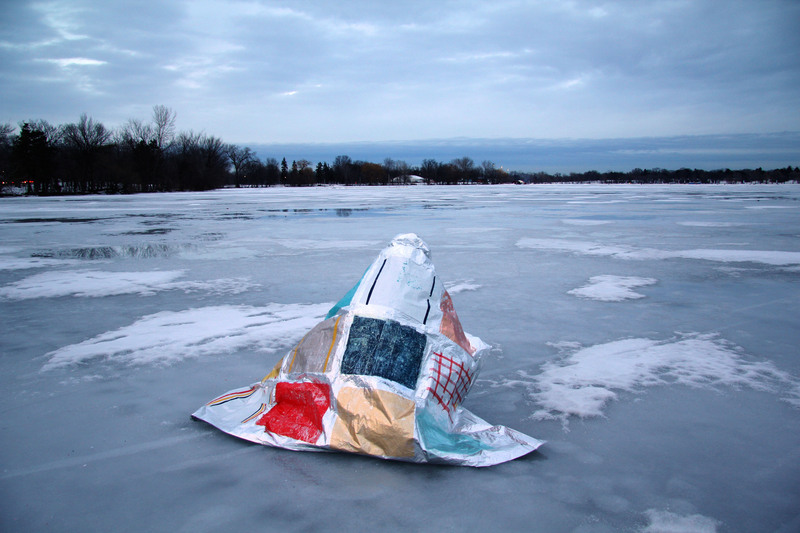 In her series “Emergency Blankets” she printed maritime signals on emergency blankets, creating tools that explore long-distance communication, refugee crises at sea, and survival. Finally, a series of collage studies by Cameron McEwan approach the notion of crisis through a reading of what the architectural historian Manfredo Tafuri has called the “project of a crisis.” For Tafuri, crisis was etymologically linked with the political category of decision (de-cision, to de-cide, to de-fine), which shares the prefix de- from the Latin for “off” meaning “to cut off” or to separate and isolate. These ideas are given political and methodological significance in Tafuri’s work as he constructed a project from the fragments of the historical avant-garde and theorized the relationship between architectural and political ideology, between critical thought and agency. Cutting, separating, isolating, joining together of material, are operations in the construction of a collage or montage. The collages in “Notes on the Crisis of Historical Consciousness and Formal Knowledge” take Tafuri’s statement on the project of a crisis as a point of departure. They operate on the historical and formal knowledge of architecture, combining and recombining elements and forms. They examine conventions of authorship, predictability, composition, and the relationship between thought and image, reflective and projective operations. History, knowledge and thought are put into crisis toward a possible remontage.